This week on Shadowhunters, everyone was very interested in Lilith all of a sudden. Jonathan went to see the Seelie Queen about the sword he was looking for and he offers to kill Lilith for it (and to save his own life). 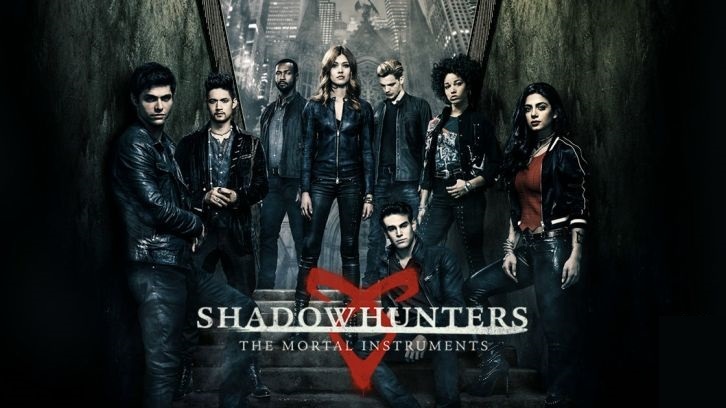 Right when he’s about to strike, Lilith is pulled from Edom by Clary, Izzy, Jace, Simon, and Cain (for protection) who want to know how to unlink Clary and Jonathan. She tells them it can only be done with heavenly fire for which they need another sword that no longer exists. 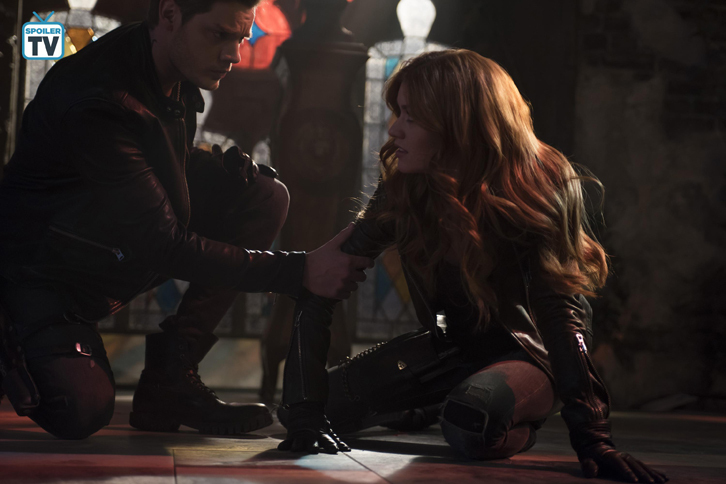 Jonathan attacks, Lilith is freed by Cain and Clary manages to trap Jonathan. Izzy tells Clary and Jace that the Clave may have an off the books operation that involves heavenly fire. Magnus is in bad shape. Alec asks Lorenzo for help who removes the magic he gave earlier. Magnus asks his mother for the family ring so he can propose to Magnus. Luke is freed from Prison by the Praetor Lupus. Oh, great: It gets a bit awkward when I find myself siding with Jonathan, but at least he had the right idea. That idea was to kill Lilith. Sure, his motives were evil but it sure was better than what the good guys did. I’m sorry, but how arrogant do you have to be to think you can summon one of the most powerful demons to ever exist and contain her. Of course, she was going to get free. And yeah, they wanted answers and she was the only one who could give them. I’m still surprised she actually gave those answers, probably only to rub it in their faces that their only option no longer existed. Little did she know that was not actually the case. Though finding a specific sword in Idris is like finding a needle in a haystack. Good luck, guys. Consequences: As sad as Magnus was the first time he lost his magic, it’ll be worse now. To have it back for only a little while and lose it again. We saw how ingrained his magic is in his identity, he’s been a warlock all his life, without his magic he doesn’t know who he is. Alec may have fallen in love with him for different reasons but the absence of his magic will definitely leave a mark on their relationship. Which is why I don’t think this is the right time to propose marriage. Personally, I’d wait until Magnus is in a better place mentally. We did receive some clues as to where this storyline is headed from Lilith. It’s no coincidence that she mentioned the name of Magnus’ father. I wonder if Magnus will be desperate enough for his magic that he’ll confront his father again. Called it: I told you Luke wouldn’t spend a lot of time in jail. There’s no way they would have left a werewolf in jail, too much risk of exposure. I have to say though, my money was on the Clave. But I guess they figured werewolves are the Praetor’s business. I got a weird vibe from that guy, though. This leaves Luke indebted to them. I have a feeling that he won’t fully agree with how he’ll be repaying that debt. Nice save: For a minute there I thought Clary would disappear with Jonathan. I’m still not ruling it out as a possibility for a future episode. But for now, she seems to have it under control. 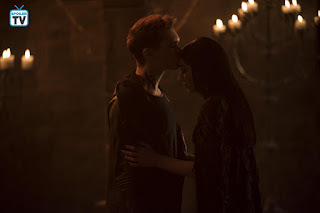 However, if it hadn’t been for Simon, Izzy could have died. I’m surprised his first move was to bite and not just push out of the way. I guess those vampire instincts are pretty strong. A choice he later regretted. Drinking angel infused blood turned him into a daylighter. I wonder if drinking Jonathan’s, which was infused with demon blood, will have a nasty side effect. I guess only time will tell. It’s not you, it’s me: I realized something this week, something I should have figured out before (you’ll all say “duh”) but I figured out why I’ve been so frustrated with these last few episodes. We know that we’re slowly running out of episodes, but the writers didn’t at the time. This half of the season was only meant to cover book 5, of which I don’t remember much (which probably means it was a bit boring). All of this was supposed to be build up for the events of the final book. They thought they’d have an entire season to cover that gigantic sixth book. Instead, it’ll be a big 2 and a half hour episode to cover 700+ pages, while they had 10 episodes for 500+ pages. Not fair, I know, but also not their fault. I will try to move past it.